Second club team in the Midwest Collegiate Cycling Conference. Our very own Cat Culkin was the first non-varsity woman in the history of the MWCCC to wear the leader's jersey!! Three members qualified for nationals! Another third place in the MidWest from your favorite club team! We also sent three members to nationals. The team at MWCCC championships on April 27, 2014. Team third place in the Midwest Collegiate Cycling Conference. The University of Michigan cyclocross team had their first and only “home game” of the season on Sunday November 10, at the Tailwind Racing event at Veteran’s Park in Ann Arbor. The sky was as grey as the gravel in one of the more evil corners of the circuit, the grass as green as the kit worn by the Michigan State cyclists we have been beating all season, and the drop in the first downhill muddy hairpin corner as vertiginous as any that the wonderful Tailwind team have created for all of us Michigan cyclocrossers so far. Ellie Sterne set the tone by winning the Elite Women’s category. In category 4, Cat Culkin podiumed in fifth place in only her third race ever. Kayla Wiggin brought a beautiful belt driven mountain bike to the single speed race and came fourteenth - in only her first bike race of any kind ever! Tyler Carlton placed fifth in Category 4. In the same race, Tyler Trask came ninth out of 30 racers, in what was only his second cyclocross race ever and while riding a mountain bike. In Category 3, Harvey Elliott placed sixth and Zach Benet twelfth. In the Elite Men’s category, Danny Soltan came seventh. In Category 5, Phil Ginsberg rounded off the day’s events by finishing third. Several of the U-M cyclists took part in a clinic the day before held by Erin Disterheft from Wenzel Coaching. They highly recommend attending one of Erin’s clinics, which are fun, effective and comprehensive. The team looks forward to shredding more mud in the next race in the Tailwind Racing calendar. October 6th, 2013. The day dawned dark and stormy. The weather report: 90% chance of rain with a chance of flash flooding. So what did nine University of Michigan cycling team members think as they rolled out of bed? “What a perfect day for cyclocross!" The team had an excellent turnout at the Lower Huron Cyclocross race this weekend, hosted by Tailwind Racing. The course was already “greasy” as we did a pre-ride before the first race, and it grew wetter and muddier with each race. It featured winding grassy flats, a U-shaped sand pit (which couldn’t be ridden even by the most skilled A rider), a sandy, off-camber downhill turn, and a mud-slick run-up. Ellie Sterne running up the sizable hill at Lower Huron. She dominates with a 2nd place in Women's 1-3! Photo courtesy of Mark McCulloch. The first race of the day was the Cat 4/5 Men, with Tyler Carlton and Tyler Trask representing the team. Tyler C abandoned the race after a fall and a debilitating shin injury, but Tyler T finished his second-ever cross race strong, and on a mountain bike for that matter. The second race of the day was the Women’s Cat 1-3, Men’s Cat 3, and Master’s 45+ Cat 3. I finished 2nd in the Women’s Cat 1-3 by riding cautiously in the wet conditions. Among 11 riders in the Women’s Elite category we had two DNFs due to crashes, one on a wet gravel hill and another in the sandpit. In Men’s Cat 3, Danny Soltan took to the podium with 3rd place in the 19-34 age group while Harvey Elliot was not far behind, finishing 6th in that category. Kurt Schaldenbrand managed the distinction of finishing the Master’s race looking completely clean, while the rest of us were covered in mud from head to toe. Kurt jumping some barriers. Even big guys can fly! Photo courtesy of Bob Bruce. Danny on the podium in his first cat 3 race. Danny, you need to upgrade again. The final race of the day was Women’s Cat 3-4 and Men’s Cat 5. We had two racers in the Women’s Cat 3-4 race, an excellent turnout! Elise Machiele podiumed with 4th place and Catherine Culkin took 6th. Keep in mind: this was their first cyclocross race, ever! In the Men’s Cat 5, Philip Ginsberg also stood on the podium with 4th place in his second cyclocross race ever. I’m excited to see what Elise, Cat, and Phil will do as the season progresses! Elise Machiele making us proud! Nice work making that podium! Also, congrats to Catherine Culkin for 6th place! Phil on the podium. Nice medal, man! 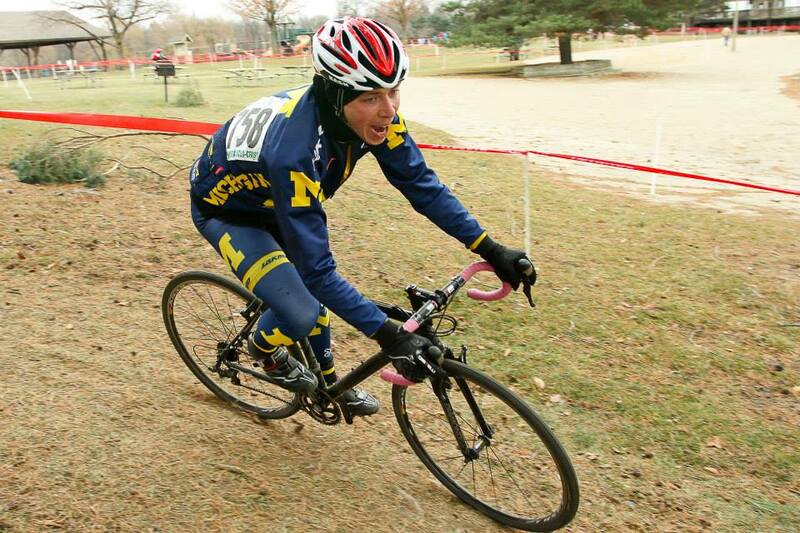 Phil looking spiffy in the Michigan Kit as he cruises on towards a 4th place and a podium! Overall, we had a great turnout and a great time. When it was all said and done, cleaning the excessive amounts of mud off of my bike was far more satisfying and less like a chore than usual. The next cyclocross race in the Tailwinds series is Mad Anthony on October 19th (see the video below). We hope to see you there! After staying up late Saturday night to watch that mess of a football game against Connecticut we were back at it Sunday morning for day 2 of the Waterford Hills CX. Sunday’s UM crew consisted of Danny and me racing 4’s, Harvey racing 3’s, and Zack taking plenty of photos. The weather was pretty chilly out there, with an average temp of 55°F according to the Garmin. To change things up a bit the race directors announced that we’d be running the course from Saturday backwards. Also, they threw in a couple extra chicanes to slow things down a bit before the barriers. The change of direction, as well as a lot of the racing lines getting nice and worn in, made for faster lap times throughout the field. Day 2 of Waterford Cyclocross. Dizzy yet? We rolled up to the start line and patiently waited for things to get underway. I wasn’t really paying attention when people started lining up, so I missed my chance at getting a spot in the front row. Not all was lost though as Danny grabbed a front row spot, so I lined up behind him as I knew that he wouldn’t waste too much time getting to the front. Tyler waiting for the whistle to blow. Look at that determination. Eventually the whistle blew and we started the dash down the pavement for the first corner. Everyone made it through cleanly and I ended up a few spots behind Danny with both of us being somewhere in the top 10. The first trip through the barriers, which came really close to the start, was a bit chaotic as the whole field was still pretty much together. Tyler Carlton midway through the barriers. Perfect form! After about half a lap Danny made a big move on the pavement in the section right before the biggest climb on the course, which we took in the grass rather than the pavement like on Saturday. The hill was one of the parts of the course that I focused on surviving rather than trying to hammer up it, so I let Danny go and wouldn’t really see him again until the finish. As the first lap came to a close I was pretty happy to find myself still solidly within the top 10. My goal was to just keep riding within my abilities and try to hold my position. I dropped a few positions on the second lap, but overall was still doing well and feeling much better than Saturday. I was cautious though as in the past the third lap is where I had started coming unraveled. I just kept trying to execute my plan of going hard in some sections and taking it easier in others. Lap three came to a close and I was relieved that the suffering was over halfway done and I had managed to not fall apart yet. Lap four was more of the same, trying not to explode while simultaneously making sure I didn’t get caught from behind. I hit the brisk headwind on the finish straight yet again and heard one of the more glorious sounds in cx, the bell for the final lap. I was on pace for my best cx finish yet and all I had to do was make it around one more lap without getting caught. Now I had one of the racers in the 44+ category in my sights so I used him as a bit of a rabbit to chase around the course. I caught him with a few turns to go, but more importantly I hadn’t let anyone catch me. As we approached the finish line a bit of a half-hearted sprint ensued, but I didn’t really put too much into it since I knew he wasn’t in my category and I was done tuckered out. It ended up being my best cross race by far. I ended up crossing the line in 8th out of 28 riders in the 19-44 cat 4 field, so it was my first top 10 finish in CX. My average heart rate came in at 187 bpm, which was actually my lowest average so far this season. Also, Danny came up big yet again and took home his 2nd win in as many days and 3rd straight podium finish. After the race it was time to get changed and watch Harvey take the course with the rest of the cat 3 men. Danny on the podium for winning the Men's Category 4 race! Harvey Elliot taking 5th place in the Category 3! In true cyclocross fashion, the 2013 Waterford race weekend was a Saturday/Sunday double header. After a day of on and off rain on Friday, the first day of racing started at 10am on Saturday with the Men’s Category 4 race. This race was to be 35 minutes long, which would be 5 laps of the course. The Waterford CX course winds its way through the Waterford Hills Road Racing racetrack, a 10 turn road course normally reserved for the local stock cars and modifieds. The 2012 NASCAR Sprint Cup Series champion Brad Keselowski actually began his career racing karts at Waterford Hills. The course setup for this year’s Waterford cyclocross races utilized the short dirt trails that crisscross the track’s infield “bowl”, several other short elevation changes around the track, as well as several stretches of the smoothly paved track itself, but was mostly grass. On Saturday morning the course was damp with the previous day’s rain and included several slippery off-camber turns. Several long straightaways into the crisp ~10 mph winds also became unexpected challenges. In contrast to the previous race weekend’s twisty course at Ithaca, the Waterford course was certainly much more of a “power course” because of the paved sections, numerous other straights, and due to the use of only one set of barriers. Danny Soltain headed through one of the trails in the bowl. The men’s Cat. 4 race included the University of Michigan’s Tyler Carlton (Sr., Ecology and Evolutionary Biology) and myself (Gr., Macromolecular Science and Engineering). We hoped to improve upon our performances at Ithaca (19th and 4th, respectively, of 50 Category 4 racers). The race began on the homestretch of the racetrack and then took a wide first turn onto a slight rise and onto the grass. I got off the start line in good position, slotting into the top 5 after the first turn. Using the paved section halfway through the first lap to improve this position, I moved into 3rd and completed the first lap comfortably sitting on the wheel of the two riders in front of me. By this time, the group with which I found myself had distanced 4th place and the rest of the 25-man field. I maintained consistent lap times over the next 3 laps, while the lap times slowed for the others in the top five positions. Danny Soltan takes advantage of the overly aggressive turn taken by his competitor, Max Staran (Wolverine Sports Club). Without having made a dramatic move or a conscious acceleration and with only one lap remaining, I had opened a significant margin over second. I completed the last lap cautiously, to both avoid a costly bike handling error and to preserve my legs for Sunday’s second day of racing, and crossed the line about a minute ahead of second place. Tyler Carlton made several passes on the last lap and sprinted to the line to finish at the front of the group with which he was riding to collect 13th place. Danny Soltan taking one of the many turns. Second place was far behind by now as this was the bell lap. "The race took place in downtown Milford. The course was a 0.92 mile loop composed of 4 standard 90 degree turns and one hairpin bend leading to an uphill sprint finish. I raced in the Cat 4 race along with fellow Wolverines, Zach, Tyler, Danny and Stephen. They are in Ann Arbor this summer racing for the Ann Arbor Velo Club (AAVC) so I was the only one sporting our sharp maize and blue kits, but the guys did their best to help me out as if I was part of the AAVC team. Our race was 40 minutes + 2 laps...."
We are working to get this new website up and running. Sometime in the future (hopefully pretty soon!) all pages will have content and updated regularly. Look here for future news and also the Events tab for upcoming meetings, social gatherings, or regularly scheduled rides and training sessions.